World Breastfeeding Week (WBW) http://worldbreastfeedingweek.org/, coordinated by the World Alliance for Breastfeeding Action (WABA) http://www.waba.org.my/, is an annual celebration in over 120 countries. The 2015 World Breastfeeding Week theme is “Breastfeeding and Work: Let’s Make it Work!” WABA calls for international action in supporting women to combine breastfeeding and work. Whether a woman is working in the formal, non-formal or home setting, it is necessary that she is empowered in claiming her and her baby’s right to breastfeed. We define work in its broadest form from paid employment, self-employment, seasonal and contract work to unpaid home and care work. There are many different strategies that we can consider to support women to reach these goals. Our hope is that these strategies move far beyond World Breastfeeding Week, and continue throughout the year. This support needs to come from all sectors. Here are the objectives from WABA for the community to consider when looking at initiatives to promote, protect and support breastfeeding. 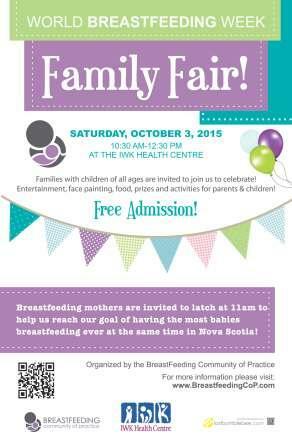 We celebrated World breastfeeding Week with the Breastfeeding Community of Practice at the IWK Health Centre on October 3rd at 10:30am-12:30pm. Families with children of all ages and members of the community were invited to join us in this celebration! There was entertainment, face painting, food and prizes! This was a great success! A lot of fun was had by all! At 11am sharp, breastfeeding mothers participated in the International Quintessence Challenge(the big latch-on) where we hoped to reach our goal of having the most children breastfeeding at the same time. Our numbers are in and we had 79 mothers and 82 children latched simultaneously for this event! Our numbers were submitted to the Quintessence Foundation in BC so we should soon hear how we placed worldwide! Thanks to everyone who generously donated prizes!